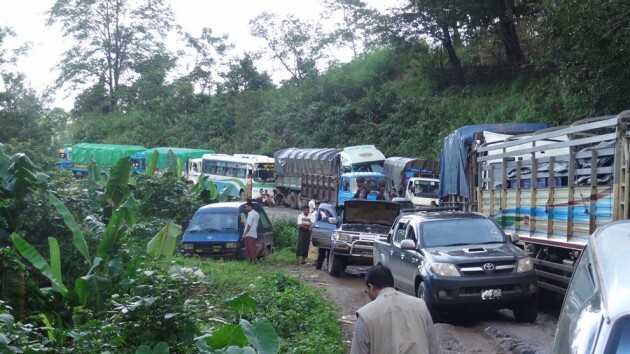 The Kawkareik to Myawaddy road, a major trading route between Burma and Thailand, is still blocked by landslides caused by the recent heavy rains. The road crosses the Dawna Ranges has been blocked since July 28 and has yet to be cleared of the debris from the flooding and landslides. Speaking to Karen News, the traffic police officer in charge at Kawkayeik said. The police officer said that the relevant authorities are organizing the removal of debris and the reconstruction of the road as soon as possible. A traveler on the Kawkareik-Myawaddy road who witnessed the landslides told Karen News that the road is block and cars and trucks are unable to use it – only motorbikes can pass through the mountain road. A car driver who makes his living by traveling from Hpa-an to Myawaddy said that cars are not allowed to use the road for at least two weeks and parts of the road to Hpa-an, Kyonedoe, Kawkayeik and Myawaddy are flooded. The driver said it is going to be hard to make a living in the next month. Travel restrictions on the road have affected traders and merchants who are worried that it will take a long time before they will be able to reuse the road. Chaiwat Withitthammawong, president of the Federation of Thai Industries of Tak quoted in the Thai media estimated that trade lost between the countries because of the flooding could be as high as 1.5 billion baht in damage to goods ready for transportation across the border to Burma.